says "The Accidental Prime Minister is an Hindi movie based on Sanjaya Baru's book, directed by Vijay Gutte starring Anupam Kher as Former Prime Minister Manmohan Singh along with Akshaye Khanna, Suzanne Bernert, Aahana Kumra, Arjun Mathur, Vipin Sharma and Divya Sethi." to get instant updates about 'The Accidental Prime Minister' on your MyPage. Meet other similar minded people. Its Free! 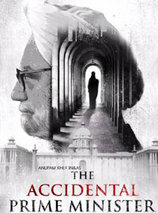 the accidental prime minister says "The Accidental Prime Minister is an Hindi movie based on Sanjaya Baru's book, directed by Vijay Gutte starring Anupam Kher as Former Prime Minister Manmohan Singh along with Akshaye Khanna, Suzanne Bernert, Aahana Kumra, Arjun Mathur, Vipin Sharma and Divya Sethi." the accidental prime minister says "The Accidental Prime Minister is an Hindi movie based on Sanjaya Baru's book, directed by Vijay Gutte starring Anupam Kher as Former Prime Minister Manmohan Singh"